Bring a dramatic look to your garden with the Panacea Giant Trellis. This trellis has three wide panels which stack on top of each other for a bold look. A curved top adds a gentle hint to this otherwise sturdy item. 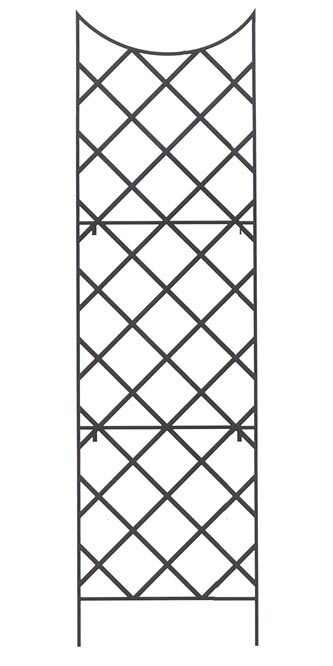 The diamond shaped grid offers support to your large vines, climbing plants, or flowers. Train your plants to create interesting patterns by weaving them in and out of the trellis as they grow. The item features two 7.75" long legs that stake securely into the ground, as well as includes brackets to mount it to a wall. The black, powder coated finish protects the steel construction and creates a durable trellis. Create a compelling garden accent with the Giant Trellis. Some assembly required.